Статья переведена Александром Захаровым специально для http://www.digital-daily.com/. These days, more and more notebooks able to replace the huge and poorly portable Desktop Computer are emerging and offer better communication features, on par at performance. Unfortunately, far not all of them will be easy to carry around, especially in the public transport. Despite all the engineering survey, the major issue is weight. The 2.5-3 kg by specifications does not seem so much. But do not forget that you would have to carry the notebook in a bag, often with the PSU, disks, documentation and other personal belongings, which normally doubles the weight of the "hand-luggage". But, provided you have a vehicle of your own, all these problems vanish - just drop it into the passenger compartment and that's it, you can go wherever you like. Even if the problem with transportation is not so serious, there is one more interesting aspect - is the modern notebook really able replacing the huge CPU unit? Being enthusiastic about this topic, we took two accessible ASUS notebooks of the "Home & Business series" - V6 and M6 with discrete graphics (models V6X00V and M6Q00VA) and decided first to concentrate on their performance. The choice of these models is dictated by the following two factors. First, these are not the most expensive systems, i.e. they are affordable to wide public. Secondly, you can view a detailed description of the appearance and usability features of these notebooks in our other materials (M6S00NE and V6000V), so we are not dwelling on that and are moving now to the tests. Well, here is a brief tour around the package bundle, usability, and specifications of the "guinea-pigs". Nylon bag to carry the notebook around. This notebook is very attractive, delicate and thin to look at. Its tint is black-grey-silver. All the surfaces are of mat color, nice to touch, and not slippery, which allows holding it more confidently without leaving ugly fingerprints. The housing is made of light metal alloy, which imparts rigidity to the structure. On the upper lid, there are four smart bright blue LEDs (power, network, or battery, Bluetooth, Wi-Fi), with the remaining indication hidden inside. 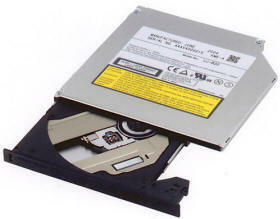 On the left panel, there is the optical drive DVD-Multi, a PCMCIA slot, an infrared port, an IEEE 1394 connector, a connector to plug in an external monitor, and a Kensington security lock socket. To the right, there are four ports: USB 2.0, Ricosh card reader, audio connectors to plug in earphones and a microphone (if the integrated one is not suitable at quality), as well as RJ-11 and RJ-45 sockets to plug in a modem and the hardwire network. The power supply adapter is also connected over here. On the front and rear panels of the housing, there are no connectors. This is very convenient for work at home or in the office, but is not always of convenience in the journey because it's just the lateral panels which are held most often. On the other hand, you don't have to use the hardwire interfaces or plug in other devices on the go. The notebook offers a full-sized keyboard. On the black keys, there are Russian and English characters. We had no claims as to the positioning of letter, numeric and control keys. They are easy to press, with almost no sound. The TouchPad that has a scroll bar is sensitive enough, and areas around it serve as a good а support for the wrists. The screen which is slightly edged in black offers the standard 4:3 relation of sides, but the resolution is not standard - 1400х1050. With that high resolution, some screen items seem a bit too tiny, and to make the work more comfortable we had to increase the speed of the pointer movement (with the standard settings, its transposition from corner to corner took a triple run over the TouchPad). The notebook is based on the Intel Centrino Sonoma platform which includes Intel Pentium M 760 processor, the Intel Alviso 915PM chipset, and the wireless network adapter Intel Pro/Wireless 2200BG. The processor is built on the base of the Dothan core, offers 2 MB L2 cache size, operating clock speed 2000 MHz, and uses the 533 MHz system bus speed. The chipset Alviso 915PM offers support for all the advanced technologies and allows the manufacturer to manipulate the price and performance of the assembled system. To reduce the price, Intel Celeron M with the bus speed 400 MHz and DDR-333 memory can be used. Besides, there is support for SATA hard disks. Certainly, because regular DDR is inappropriate for Intel Pentium M, so DDR-2 is used although unfortunately in the single-channel mode provided by the single 512 MB module made by Infineon (64T64020HDL3.7A). 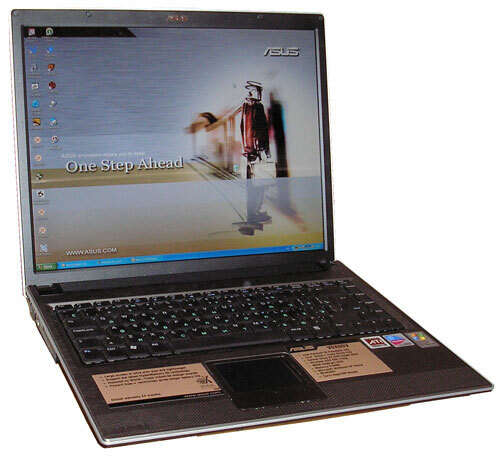 The notebook uses a discrete video card - the ATI Mobility Radeon X600 (M24) chip having 64 MB DDR video memory expandable up to 128 MB using the HyperMemory at the expense of the system memory. 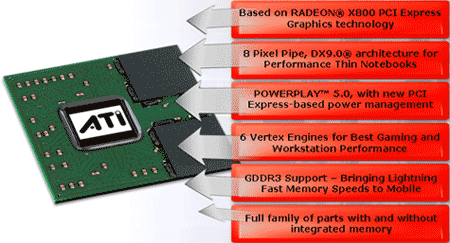 This chip is fully compatible to DirectX 9.0, offers 4 pixel pipelines and two vertex ones, supports SMARTSHADER 2.0, SMOOTHVISION 2.1, HYPER Z III+, LTRC (LCD Time Response Compensation) that reduces the effect of the matrix's response time on the image quality, as well as special mobile technologies PowerPlay 5.0 and Vari-Bright that control the power consumption of the chip and the matrix's brightness. The graphic processor itself runs at 400 MHz, and the memory at 500 MHz thus reducing these parameters to 200 and 360 MHz respectively when battery-operated. Once we are talking about the video system, a few words on the matrix as well. The manufacturer proudly declares the diagonal size and the default resolution in the specifications. Behind the scene are the viewing angle and the response time, as well as the Glare, mysterious to many. In fact, the Glare is a special coating of the matrix that creates the effect of a glassy monitor (sometimes it is mentioned that the matrix is made on a special glassy substrate). Such coating allows producing better viewing angles and much deeper black color, that is, the enhance the contrast ratio. Besides, coating like this makes the screen look more effective. The other side of using this coating is enhanced reflectivity of the matrix, especially on the "deepened" black background, which is not very comfortable (sometimes you have to choose the place for work for quite a while to have the screen not reflect anything). The screen of V6X00V offers superb horizontal viewing angles, but the vertical ones might have been better greater. Especially annoying was the sharp clearing of the image upon looking a bit upwards - that requires regular tuning the turning angle of the notebook lid while changing the run position. Besides, over the bottom edge of the screen a distinct glare of the matrix with backlight is vividly seen. But we were delighted about the response time. Unfortunately, we were unable to measure this parameter and it was not there in the specifications, although subjectively it seemed to be 16-12 ms. On dynamic images the smearing effect was almost invisible (unless you peer into, it's not seen at all). Now coming back to the interior of V6X00V, let's look at the disk subsystem. The notebook uses the Hitachi Travelstar 5K100 (HTS541080G9AT00) hard disk of 80 GB capacity and 8 MB cache, with the spindle rotational speed 5400 RPM. The hard disk uses the PATA UDMA 100 interface. Its operating performance was taken with HD-Tach software. The average seek time is 16.6 ms (minimum - 5.5 ms), average time of reading from plates is 29 MB/s, with the peak buffer read speed being 92.2 MB/s. The processor usage by disk operations did not exceed 1%. These characteristics are sufficient for a mobile hard disk but they loose to the mid-sized hard disk of 3.5" form factor, with the spindle rotational speed 7200 rpm. As the optical drive, DVD-RAM Panasonic-MATSHITA UJ-822S recently out of production. We verified the drive capabilities using the Nero InfoTools. Judging by this information, the drive operates with all the popular media types, which is not as fast as we wanted but enough for a mobile device. The drive is not multi-zoned, i.e. RPC 2 is used. Since the optical drive takes an active part in the data exchange, we decided to test it a bit. For that, we read CD and DVD disks of not the best quality with it, verified the capability of copying Audio-CD and wrote a couple of matrices (CD-R and DVD+R). The drive failed to cope with the scratched CD-R matrix. On the other hand, it showed superb grabbing performance both at quality and capability, but for the lack of high speed. Despite being far not fresh, the DVD-Video disk read fine. We were able to write the Acme CD-R matrix certified as 52x only at the 8x speed. Even with that, the recording quality can be regarded as satisfactory. To be sure, we repeated the experiment. After the second try we succeeded in producing a good result. The drive is modern enough, although during operation it can be one of the noisiest system component. On the other hand, it offers good operating performance, but you'd better spend some extra for good-quality media. 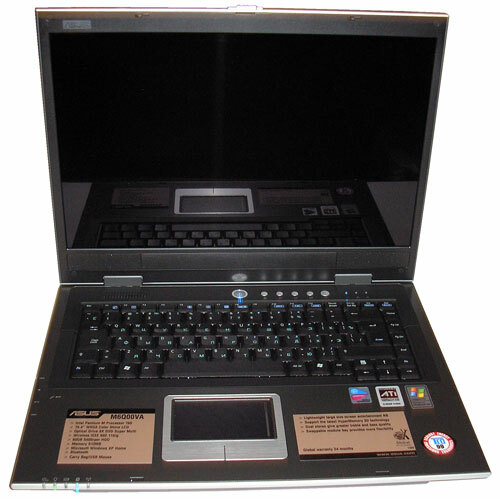 The audio system of the notebook is made up of the software codec Intel 82801FB AC'97 and two speakers. The low characteristics of this system are caused by small capabilities of the codec and low power of the speakers. The sound offers almost no low frequencies and proved strongly directional, although the sound volume is enough. It was not of much pleasure listening to the music and watching videos though. What saves the day is only connection of the acoustic system. During operation, especially when executing demanding tasks, the right-hand part heats up immensely, but the cooling system does its job well without any noise. The vent holes in the bottom of the housing are in the center, thus they are not easy to block even if you put the notebook on your lap. 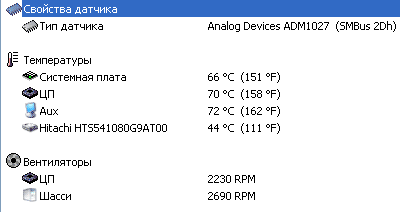 Processor proved to be the hottest part. It can be heated up with games or other resource-intensive applications up to 70-71 degrees centigrade (the screenshot was taken immediately on quitting 3DMark'03). In its stationary state, V6X00V is operated from the power supply adapter Delta SADP-65KB (19V, 3.42A) which remains warm for all the time. The standalone operation is provided by a 4800 mA* hr Li-Ion battery. This margin of power is enough for 2 hrs 44 min of operation in the mode of maximum load or for a bit more than 5 hrs in the power saving mode. That is confirmed by the graphs produced with Battery Eater '05 v.2.51. Discharge in the power-saving mode. It takes two and a half hours for the battery to restore. Prior to talking about the performance, let's look at the rival. The appearance of M6Q00VA is strict and efficient, without much bizarre, even a bit simplish if you know how much potential is hidden under the hood. The housing is made of grey plastic, very nice to touch, not showing the dirt and well hides the fine scratches and fingerprints. The inking of the housing is made by silvery edges, which adds solidity to the notebook. On the front panel, there is a number of colored LEDs: green - Audio DJ and power, orange - for battery charge, and blue - for Bluetooth and Wi-Fi wireless interfaces. Below, the grids of the speakers are visible. To the right, there is a compartment with DVD-Multi optical drive and an outlet of the cooling system. The left-hand panel is more abundant with interface connectors and controls. Here are two USB 2.0 ports, an infrared port with a card reader, a PCMCIA expansion slot, a connector to plug in an external microphone, and a S/PDIF output. Also here is the Audio DJ control panel required for Audio-CD playback without booted up operating system. On the rear panel, there is a Kensington security lock socket, a power connector, a LPT printer port, an expansion port to plug in a replicator, an output to an external monitor and TV-Out, two USB 2.0 and one IEEE 1394 ports, RJ-11 and RJ-45 sockets of the modem and network adapter, as well as a grid for the second output of the cooling system. Among the interesting features of the bottom panel of the housing, we note the three channels of air-intake for the cooling system which are located in a way to block them simultaneously so that it is very difficult to put the notebook on the lap or by some other means. When opened, the notebook looks impressive and effective due to the wide-screen matrix (default resolution 1280x800) with the speaker grids underneath. The keyboard has full-sized keys, easy and quiet to press. The TouchPad is sensitive enough, offers a scroll bar and is framed by an aluminum plate which is used as buttons. The notebooks is based on the same Intel Centrino Sonoma platform, Intel Pentium M 760 processor (Dothan core, 2 MB L2 cache size, 2000 MHz clock speed, FSB 533 MHz), Intel Alviso 915PM chipset, and the wireless Intel Pro/Wireless 2200BG network adapter. 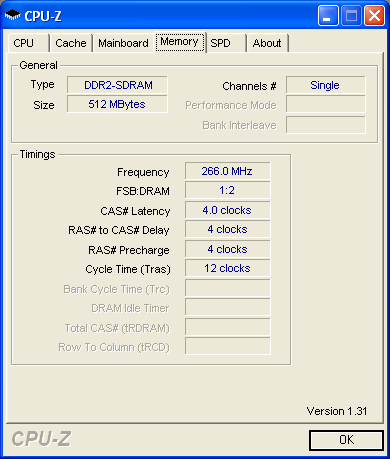 The DDR-2 memory offers the same characteristics as in the previous notebook since the same Infineon (64T64020HDL3.7A) 512 MB module is used. The distinctive feature of this model is the video system. The M6Q00VA has a rather powerful video adapter - ATI Mobility Radeon X700 (M26) with 128 MB of DDR video memory (350/600 MHz when operated from the mains, and 200/360 MHz when battery-operated), offers full support for DirectX 9.0, uses 8 pixel pipelines and 6 vertex pipelines. Besides, the chip offers support for SMARTSHADER HD, SMOOTHVISION HD, 3Dc texture compression, HYPER Z HD, VIDEOSHADER HD, as well as mobile technologies PowerPlay 5.0 (dynamic variation in the number of activated PCI-Express lines from 1х to 16х, depending on the load), and Vari-Bright (optimization of matrix brightness for current tasks), which allow saving the battery charge. The TFT-matrix of the notebook offers a number of traits. The specification declares the Crystal Shine and Color Shine technologies (method for producing "glassy" LCD displays) which, as ASUS explains, are aimed at increasing the brightness to 250 cd/m2 and providing an exclusive image quality and color depth. Indeed, the image on the screen looks very lively and colorful, although there is some reflectivity effect. At the same time, the matrix offers excellent viewing angles, both horizontal and vertical, as well as sufficient response time (to my personal perception, it is 12 ms since there is no way measuring it). There is some shortcoming about the slight glare of the bottom part of the matrix, but that is only on the absolutely black image. The notebook uses the Hitachi Travelstar 5K100 hard disk of 80 GB capacity and 8 MB cache, with the spindle rotational speed 5400 RPM. The HDD model is the same as in the already examined V6X00V, thus it offers the same speed. But the optical drive is of a different model - MATSHITA DVD-RAM UJ-840S with slightly improved characteristics. This is what Nero InfoTools tells. The drive is compatible to all popular media (including DVD-R DL, which is not recognized by the utility), offers 2 Mb buffer. While playing DVD, the RPC 2 zoning control is used, and the drive can be made multi-zoned only with a specialized software. We were indeed glad about the error correction work the company did - information was read from a scratched CD as if from a new one (remember that the same disk failed to read with V6X00V). The quality of data extraction of Audio-CD is beyond all praises. At the same time, all necessary features are supported. 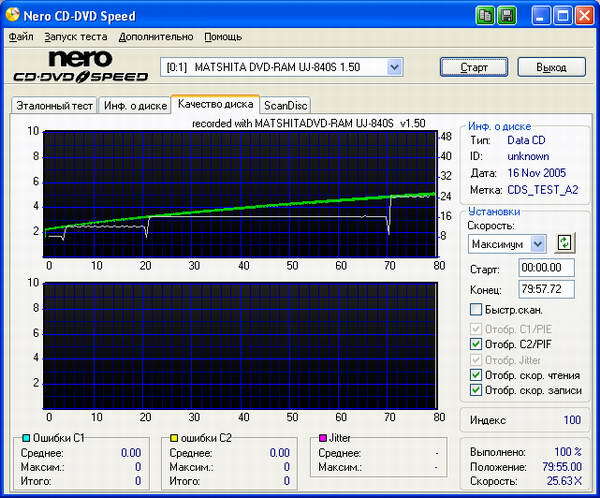 A film from a dual-layer DVD was read fast and consistently. The CPU usage is a bit too high but that is caused by the wear of the media. We found that while writing Acme CD-R matrix the speed characteristics match those in the specifications. At the same time, the recording quality is also good. Despite the use of a cheap matrix, the result is outstanding. 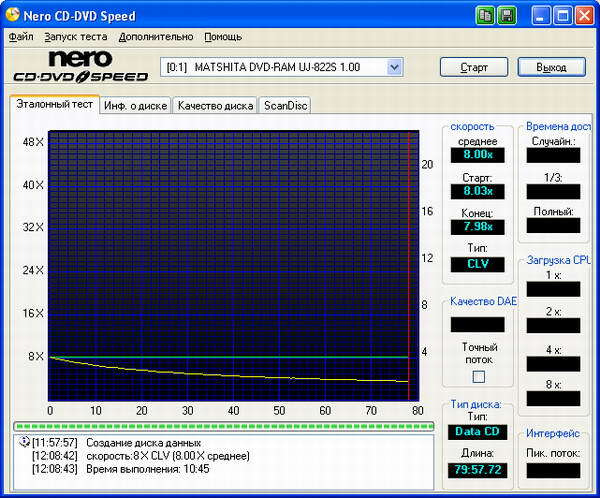 The recording of a DVD+R disk by the same manufacturer took unexpectedly much more time, and the anticipated speed was 8Х. It took over 25 minutes for burning. Perhaps the firmware of the drive is not familiar with Acme matrices, so the minimum speed strategy was followed. The guesses proved right through the results of recording. 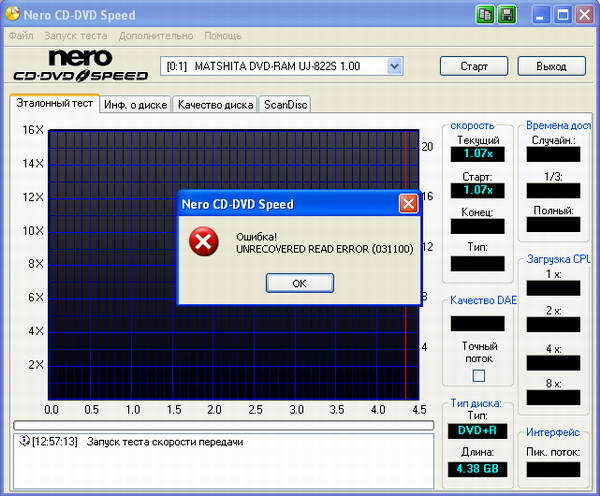 Despite the incompatibility of "Surface test" in Nero CD-DVD Speed to the drive, judging by the test for reading speed, there are no issues about the recording quality since the drive was able reaching the maximum speed. MATSHITA DVD-RAM UJ-840S is a superb multifunctional device of great capabilities and speedy enough performance. The only shortcoming is that it is the noisiest component of the notebook under study. The audio system of M6Q00VA is a real trump when compared to many other models. The matter is in the Intel High Definition Audio codec based on Intel 82801FB and four integrated speakers (two under the matrix and two on the front panel). The high-quality sound of such a 4-channel system will provide a comfortable viewing of films and immense pleasure from computer games. What lacks to set up a full-featured mini media center is a subwoofer. Inside the machine, there is quite a powerful processor and as powerful video card, and despite that the cooling system does its job well and without noise, so no overheating of components occurs. On the other hand, the bottom part of the housing is a bit hot because of the highly powerful interior. Sensor readings after 30 min. of run in Futuremark 3DMark'03. If tuned to the maximum performance, the battery lives for merely 1 hour 40 minutes. In the power-saving mode, the notebook is able running for 2 hours and 30 minutes. It takes the battery approximately the same to recharge and discharge - 2 hours 17 minutes. Since both of the notebooks under study pretend to be a replacement for a full-fledged desktop PC, then we took the results of recent tests of processors (test-benches used) and compared them versus those produced today wherever possible. Here is the specification of the test systems. Video card: Point of View GeForce 6600 128Mb PCI-Express (VGA150705P). In the fully synthetic benchmarking package SiSoftware Sandra 2005, discrete systems take a lead due to the higher clock speed of the processor or integrated dual-channel memory controller, but in the total the notebooks tested proved on par. 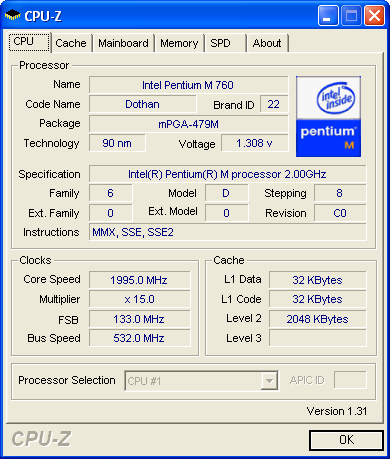 Again, the results of Futuremark PCMark'04 are affected by the high clock speed of Intel Pentium 4 530 and integrated controller of AMD Athlon 64 3000+. If compared one versus another, the difference is only in the graphics part, which is understandable. We made a direct comparison of V6X00V versus M6Q00VA using Futuremark PCMark'05. The thing which we can't explain was the repeated performance difference for the disk subsystem. At archiving jobs, V6X00V took a small lead, although theoretically the performance of the systems should be absolutely the same. The same situation is seen in WAV to MP3 encoding, and the results are 100% consistent (we decided to do a test for all the driver versions and identity of settings, but nothing changed). At video encoding, notebooks no longer lag behind the mid-end desktop system, and at DivX 5.2.1 they even take a lead. At 3D modeling packages, the notebooks being tested will show their worth, but to release the imagination you first got to bring the memory capacity up to 1 GB at least. We gathered the results for all 3DMark generations in one place, because there is a common trend - ASUS M6Q00VA offers the highest gaming performance of all the systems. Let's try to disprove that through running a couple more synthetic tests and a few games. It is really hard to disprove - AquaMark3 and Codecreatures Benchmark Pro persist in adding points to M6Q00VA with its onboard ATI Mobility Radeon X700. As you can see, even with ATI Mobility Radeon X600 you can play all modern games, although to the detriment of the image quality. 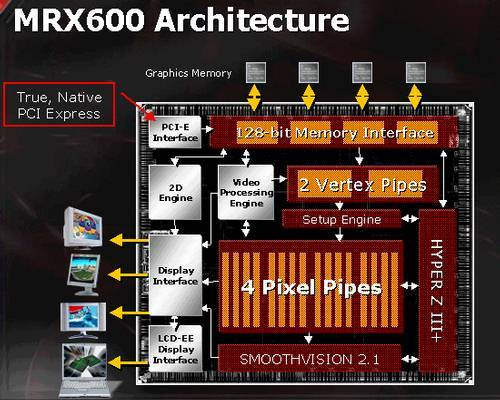 If we take ATI Mobility Radeon X700, even more demanding modes can be managed. Really thrilling results for notebooks. Anyway, we turned a bit skeptical, so one more day was spent running tests in Half-Life 2 and Doom 3 - tests are just tests, but reality may be different. At the end of the day, we got the impression that the bottleneck of these two games is the RAM capacity (1 GB is needed for a comfortable gameplay), so a slowly running HDD (having to wait too long for loading the next level and addressing the swap file all the time) is deathlike, in the direct meaning of the expression. Despite the fast running of tests at the maximum graphic settings we managed to play comfortably only at the medium settings. In the end, our gaming sympathies have been indisputably given to M6Q00VA, because it's very difficult for ATI Mobility Radeon X600 to compete ATI Mobility Radeon X700. Today we have shown that a modern notebook can be a full-featured replacement for a gaming desktop PC and a multimedia center. In so doing, it can take much less space and will let the user always have the data ready at home, at the workplace, and on the go. A tradeoff for such compactness and universality is the price and upgradeability restrictions. As regards the models which came to our test lab, there is no one-one recommendation. In terms of the gaming attraction, ASUS M6Q00VA does better, but the tradeoff for these capabilities and is the fast exhaustion of the battery charge. In its turn, ASUS V6X00V is able providing a two-fold time of standalone operation under the same medium level of working performance. So, it's up to you to decide.